Curitiba has been warned that it will be dropped as a host venue for the 2014 Fifa World Cup national team football tournament unless there is significant progress in the Brazilian city’s stadium construction project. Jérôme Valcke, the secretary general of football’s world governing body Fifa, warned that the situation had reached a “critical point” in Curitiba, which is due to host four group matches during the tournament. Fifa dropped an initial deadline of December 31, 2013, for all World Cup stadia to be ready following numerous delays at several venues. 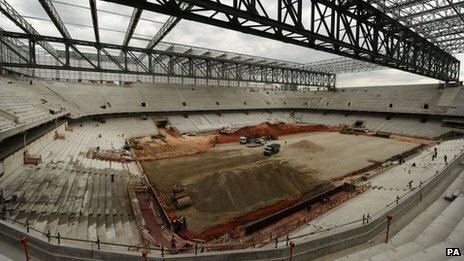 In Curitiba, workers walked off site in December due to a dispute over pay, while there have been fatal accidents during the construction projects at stadia in Brasilia, Manaus and São Paulo. Earlier in the day it emerged that Brazil’s aviation authority had decided to delay major renovations at the local airport in Fortaleza, which is due to stage four group matches during the competition, and opted instead to put up a tent terminal during the World Cup. Formula 1 supremo Bernie Ecclestone has stepped down from the F1 board after it was confirmed on Wednesday that he will face trial in Germany for bribery charges later this year. The 83-year-old, who been in charge of F1 for the last four decades, will continue however to run the sport on a day-to-day basis ‘subject to increased monitoring’. Ecclestone has been has been indicted by Munich’s state court on charges of bribery and incitement to breach of trust. They are connected to the alleged payment of a $44 million bribe to German banker Gerhard Gribkowsky. Ecclestone has insisted he is innocent of the charges made against him and has vowed to ‘vigorously defend the case’. Ecclestone has, however, stepped down from the board of the holding company which effectively controls F1 with immediate effect. In a statement released by holding company Delta Topco Limited, it was confirmed: ‘After discussion with the Board, Mr Ecclestone has proposed and the Board has agreed that until the case has been concluded, he will step down as a director with immediate effect, thereby relinquishing his board duties and responsibilities until the case has been resolved.